The Natchez National Historic Site park ranger was horrified when we asked whether we could see Melrose house without taking the tour. “We have millions of dollars worth of things in the house! We can’t let people just wander around by themselves. Not that we don’t think you’re trustworthy….” He let his sentence trail off. He didn’t think we were trustworthy. 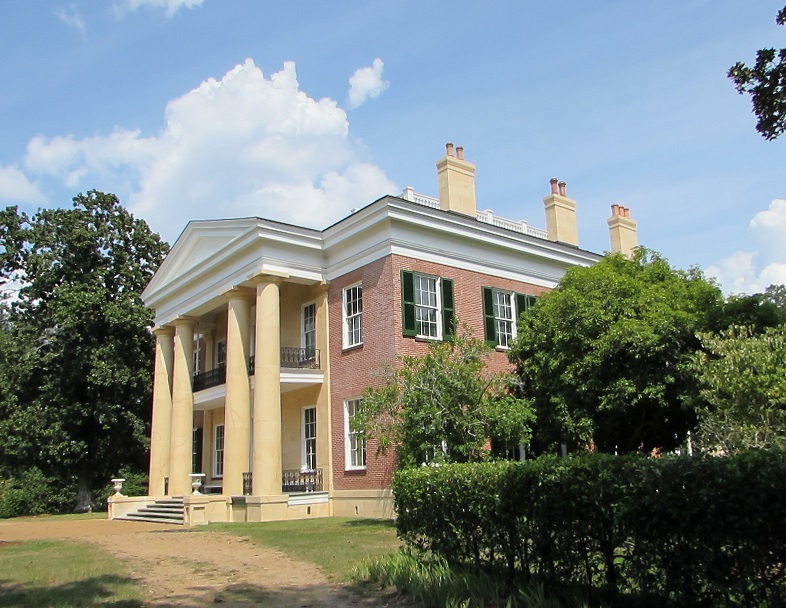 Melrose is a Greek Revival mansion built for John McMurran, a Pennsylvania lawyer who emigrated to Mississippi, became law partners with a future governor of Mississippi, and married the daughter of a Mississippi Supreme Court judge. By the mid-1850s, McMurran was in the cotton business, with 9,600 acres of land and 325 slaves. We got to Melrose on the half hour and Melrose has tours on the hour. So we had to wait for the next tour. It wasn’t at all boring, though, because (according to the NPS) “Melrose is one of the most intact estates in the south.” The park has 80 acres that includes a two storied kitchen, dairy buildings, octagonal cistern houses, a smoke house, a privy, a barn, a carriage house, and slave quarters. So we did the grounds — which has far more than 30 minutes worth of things to see — until it was time for the tour. Building started on Melrose in 1841 and the family moved in, in 1849. The house was named after Melrose Abbey in Scotland. The Scottish Melrose holds the heart of Robert the Bruce — his embalmed heart is buried at Melrose Abbey (the rest of him is buried elsewhere) — and apparently the McMurrans had been taken by the place when they’d visited. In case you were wondering: no one’s body-less embalmed heart is buried at the Natchez Melrose. That I know of. The McMurran’s sold the house to the Davis’ in 1865, and Davis descendants lived in it until they sold it to John and Betty Callon in 1976. The Davis family was very wealthy, even post-war, so the house never fell into disrepair. But the Callons, who owned a petroleum company, did major historic restoration work on the house and the rest of the property. In 1990, after a bust in the oil business, the Callons sold the house to the NPS. Each time the house sold, the furnishings sold with it. So much of the furnishings in the house are from the McMurran period. The NPS says that “Melrose was considered by many to be the finest home in all of the Natchez region.” I won’t quibble about the word “considered” again, and I’ll just say that I’m not surprised. Between the amazing architectural details, the exacting restoration/preservation and the original furnishings, the house is perfection. 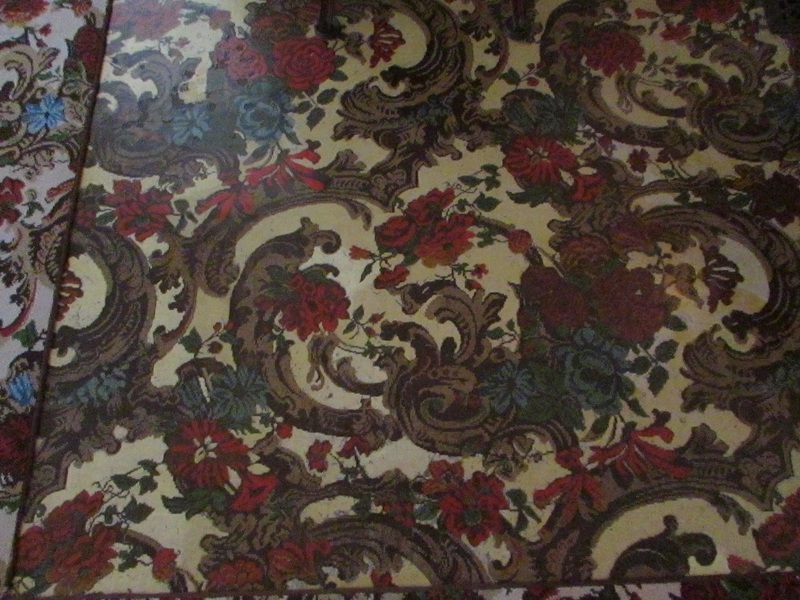 My second favorite item in the house was the original, 19th century mahogany punkah over the dining room table. There was an exhibit on the Melrose slaves in the slave cabins, and quite a bit of narrative on the slaves in the house tour as well. 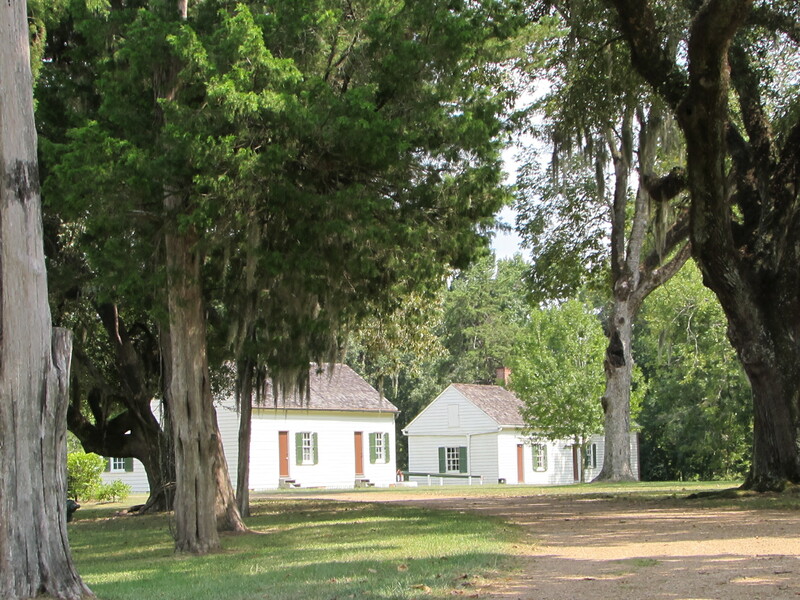 There were up to 25 slaves working at Melrose at before emancipation. After the war, some stayed on as paid servants, or took to the fields on Davis property, as sharecroppers. Melrose was unoccupied for almost 20 years at the end of the 19th century, while the Davis heir lived in New York. 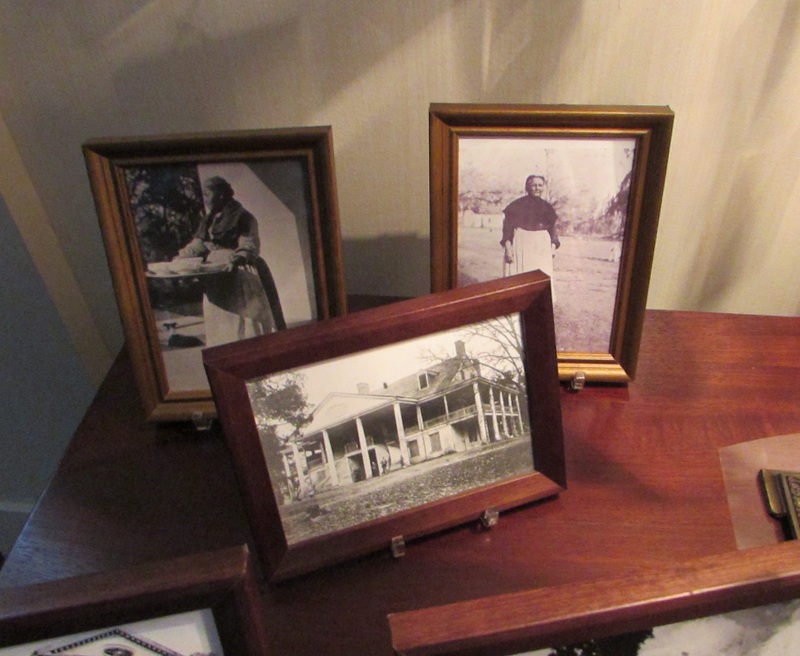 During that time, two former Davis slaves, Alicia Sims and Jane Johnson, were responsible for the house. Their photographs are displayed on a hallway table. I reviewed the website of every historic house in Natchez open to tours, and none allow photography inside (well, one allowed photographs in the the unfurnished, unrestored part of the house) except Melrose. Hurrah for the NPS! It’s this original floor cloth. They had a modern carpet with the same pattern (you can see it on the left side of the photo) over most of it, but left a large square uncovered for us to see. Yes, that first park ranger was right to be suspicious. If we’d have been allowed to do a self-guided tour, I would have stolen this floor cloth. One more thing about Melrose. We have an NPS annual pass, which usually gets us into NPS parks at no further cost. Not so at Melrose. It got us a discount, but we still had to pay. Gallery | This entry was posted in Mississippi and tagged Betty Callon, John Callon, John McMurran, Melrose, Natchez Historic Site, Natchez house museum. Bookmark the permalink. Looks well worth a few dollars entrance fee. It absolutely was. 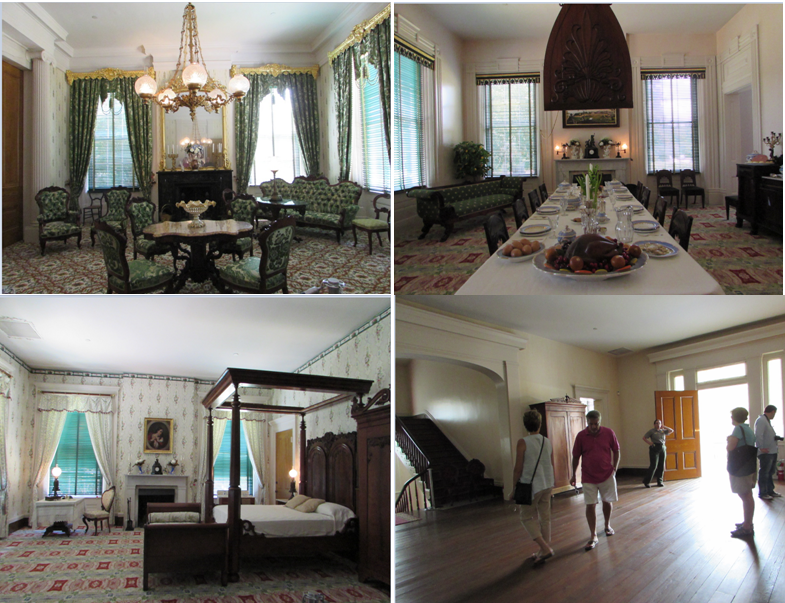 There were several historic houses to tour in Natchez and I’m very glad we chose to do this one. Beautiful! This will go on my must-see list. It really was unbelievably beautiful. 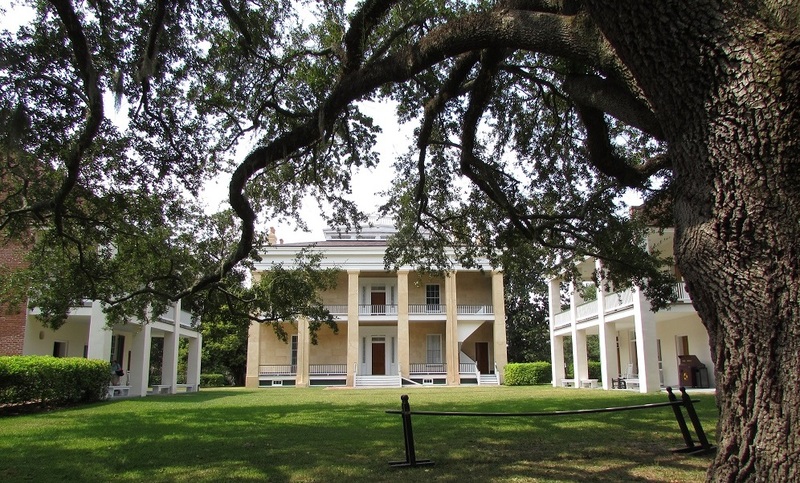 As I said to Andrew, Natchez has several historic house open for tours. While I’m sure that the others are lovely as well, I couldn’t recommend Melrose more highly. The last of the private owners took their oil money and did an amazing historic restoration job. And the fact that most of the furnishings go back to the beginnings of the house — its just all remarkable.